It is with great honor and joy that I get to share with you this month as the Featured Miracle Team Member. In pondering what to write, I decided to share with you my now experience as I know there are no accidents in what I’m currently going through and why I was called to share with you in this moment about my life of miracles. I journeyed to Ecuador for the New Year’s celebration with fellow miracle team members and soul family. I had reached a state on my journey where I was exhausted from recycling old pains, patterns and energies and had made a declaration that if I couldn’t free myself from these pains and patterns that I didn’t want to be in form any longer. I landed in Ecuador completely wiped out with maybe a 20% life battery. The healing work with Sri and Kira, the heart openings, the meditations, being with soul family and the remembering was life altering. A key moment for me was on the evening of January 6, which is celebrated in Ecuador as the day of Epiphany. 9 of us journeyed out onto the streets of Cuenca to enjoy the festivities. There were colorful lights and people celebrating in the streets. I was struggling to find enough energy to even walk. I came across a booth selling masks and brightly colored wigs. This bright aqua blue wig grabbed my attention and I knew I had to wear it. 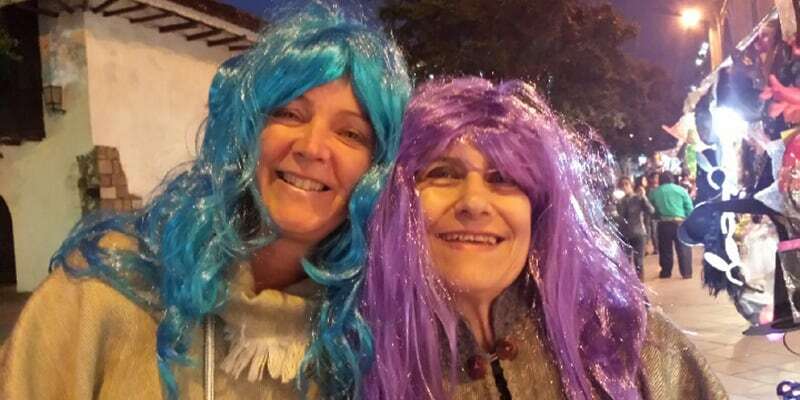 I put on the blue hair and my soul sister, Wafa (the caduceus) put on the purple wig. In that moment, I felt a powerful shift happen inside of me. It is totally unexplainable but something changed at my core. It felt as though I had reclaimed my truth and remembered who I was. I remembered that I came here to be joy and to dance. I glanced over and saw several young men dancing in a gazebo for tips. I motioned the group to go watch. Like magic, the men quit dancing and signaled for us to dance on stage instead. Wafa and Crystal both seized the opportunity. I knew I needed to dance, no matter what my body was saying, because this was my truth and I needed to re-claim it. After our time dancing, I commented several times that the blue hair changed me. It is now February 15, exactly 40 days after the day of Epiphany. I had a dream this morning that I was looking for a means to take my life. Before I could finish the dream, my dog pounced on my bed and woke me up. As I awoke in a stupor the revelations started rolling in. I went back to sleep and awoke again completely new and renewed. January 6 was a birth of my truth that happened with and through miracle team friends, a reclamation that is being realized today. Google’s definition of Epiphany is; a manifestation of a divine or supernatural being or a moment of sudden revelation or insight. Fascinating! I’m sharing my Epiphany photo of Wafa and I, in hopes that it may bring you the renewal and reclamation that it brought me.